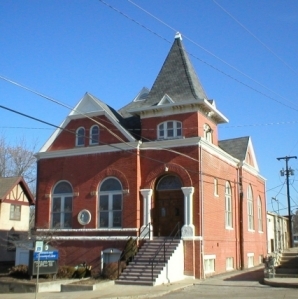 The information was provided by David Lewis Jr.
Saint Joseph, Missouri, has a wealth of varied examples of late nineteenth and early twentieth century residential, commercial and ecclesiastical architectural styles. Some of the changing tastes and influences in residential and commercial designs filtered into ecclesiastical designs, which also influenced pipe organ case design, as illustrated by these houses of worship. Some pipe organs have changed ownership over the years as congregations folded, merged or built new buildings, leaving the organ behind. This is the story of two organs in Saint Joseph, located in the Ashland United Methodist Church and Trinity United Brethren Church. 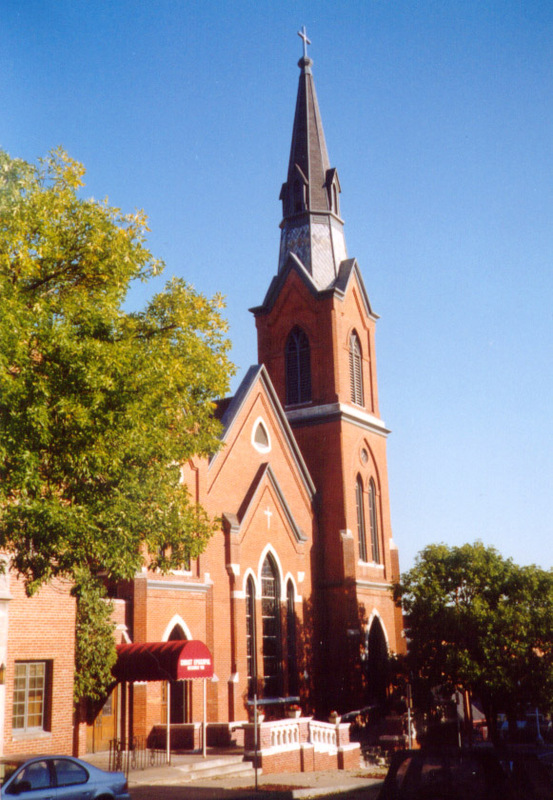 Saint Joseph enjoyed a church building boom during the late nineteenth and early twentieth century as many of the founding churches were sponsoring mission churches in the outlying neighborhoods while replacing their original edifices. 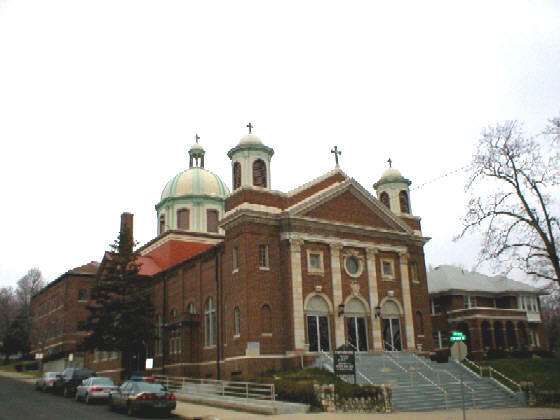 This coincided with the emerging role of church buildings as social centers in the community, or the “institutional church”, and a revolution in residential architectural design during the “Victorian” period following the Civil War. Residential designs became more eclectic, embracing elements of the Italianate, Romanesque, Queen Anne and Gothic designs. At the same time, advanced construction techniques and central heating systems allowed interior configuration to become more free-form than the traditional “center hall” antebellum plan. In general, church designs became more elaborate, featuring large expanses of stained glass windows and expansive organ cases, required to house larger pipe organs made possible by electric action. 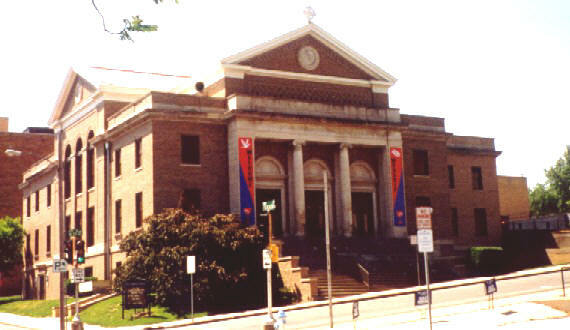 While liturgical congregations, such as the Roman Catholic, Lutheran and Episcopal churches, usually continued to utilize the classic rectangular or cruciform style nave with straight seating, the revolution in church design among “free” protestant denominations manifested itself in the “Akron Plan”, pioneered by the First Methodist Episcopal Church of Akron, Ohio, in 1866 and made popular by the Sunday School Movement, which flourished in the Methodist, Baptist, Congregational and Disciples of Christ denominations around the turn of the century until World War I. 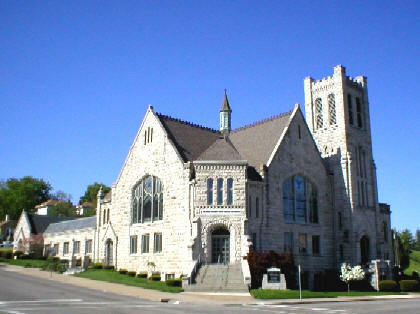 As church buildings, particularly in urban areas, were becoming weekday social centers, the Akron Plan was an early attempt to make church buildings multi-functional by placing the Sunday School class spaces on one or two levels around the perimeter of an assembly room, which opened into the main worship space for overflow seating. These same spaces could serve as meeting spaces for smaller groups during the week. The assembly room often features a clerestory for ambient lighting. Another feature of the Akron Plan is semi-circular seating or theatre style seating fanning out from the pulpit, which is on a 45 degree axis, placing seating closer to the pulpit, an important consideration before electronic amplification. Another change was the relocation of the choir and organ from a rear gallery to the front or side of the worship space. 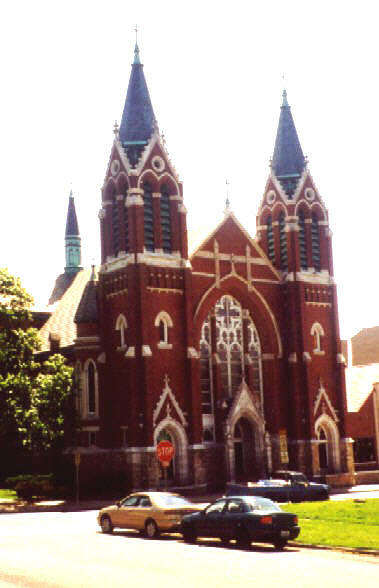 Several turn-of-the-century churches in Saint Joseph feature variations on this design. The first major church building to employ this design was the Tabernacle Congregational Church at 13th & Jules, completed in 1891. 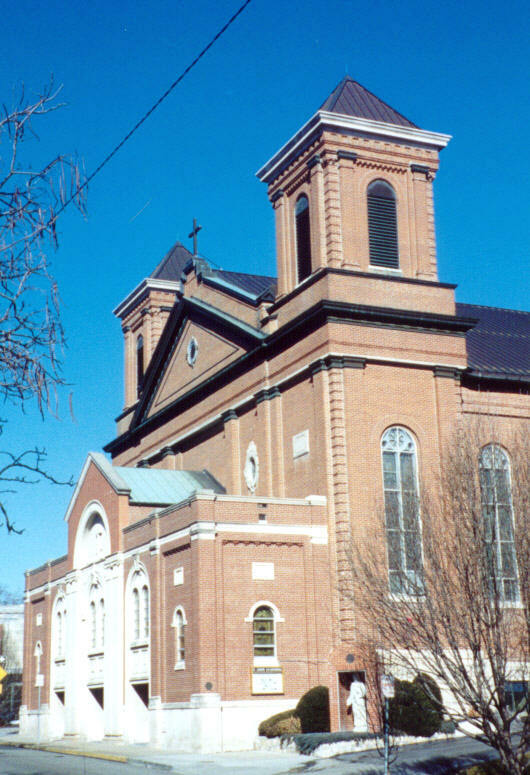 The Roman Catholic Church participated in this local church building boom by establishing three parishes to serve growing outlying neighborhoods, including St. Francis Xavier in 1890, St. Mary’s in 1891 and St. James in 1900. During the next twenty years, each of these parishes, along with Church of the Immaculate Conception (10th & Angelique), established in 1860 and Church of Sts. Peter & Paul (Messanie & Warsaw), established in 1883, built substantial new buildings that are outstanding extant examples of Gothic, Renaissance and Romanesque architectural styles. 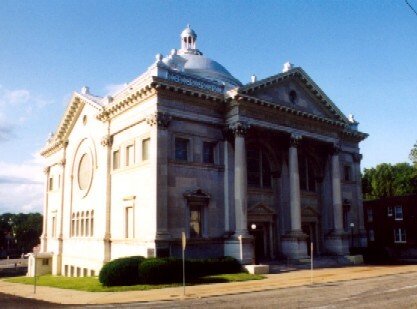 Although the “Carnegie” name is often associated U.S. Steel, Carnegie Hall, Carnegie Institute and Carnegie public libraries built in small towns across the country, from 1901 to 1919, Andrew Carnegie’s largess, through the Carnegie Corporation also helped almost 7,700 small churches purchase a pipe organ by contributing 50% of the cost. 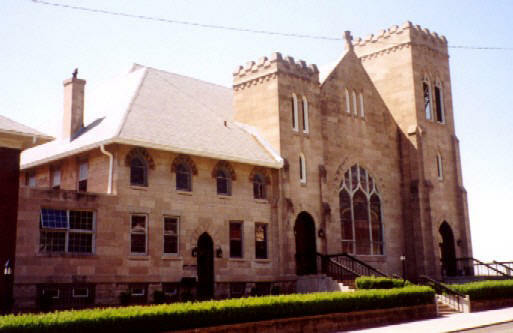 One of those fortunate congregations was the Hope Reformed Church, east of St. Joseph. David Cool, owner of Temple Organs, continues the family tradition, begun by his father, N. Frederick Cool, who began building pipe organs more than 50 years ago, in 1953. In 1975, Fred Cool moved his family and his business to St. Joseph. He retired in 1999. During the course of his career, he designed his own version of the electro-pneumatic pitman chest, which has been utilized in a number of local church organs, including Christ Episcopal Church. 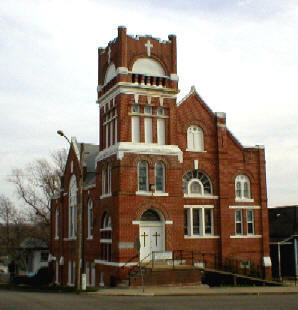 In 1977, Temple Organ Co. built an instrument for the 17th Street RLDS Church, now known as the Community of Christ. The firm has built and rebuilt more than 140 pipe organs, including a new organ for Clair United Methodist Church, and rebuilt instruments in St. Mary’s Church and Clark-Sampson Funeral Home. During the first half of the twentieth century, several large American organbuilders continued the nineteenth century tradition of offering a series of “stock models” by marketing small, self-contained pipe organs. As a result of the unification of ranks made possible by electric action, these instruments were generally smaller than tracker organs of similar size, with a footprint of about one-half-again as much of an upright piano. These organs usually contained 1-4 partial ranks, which were unified to play at multiple pitches. The console was either built into the front of the cabinet or detached. They remain popular among smaller congregations, which lack space and finances for a custom-built “chambered” pipe organ. Kilgen’s “Petite Ensemble” series and M. P. Moller’s “Artiste” series were well-built and have proved very popular in churches, school and funeral home chapels and residences. In some of their smaller 9-10 rank organs, such as the 1955 installation at Temple Adath Joseph, M. P. Moller built two self-contained divisions, often referred to as a “double” Artiste. Under full expression, these three rank instruments produce a robust sound, relying on just183 pipes, as a result of a shared common bass octave. The Moller “Artiste” pipe organ originally installed in Holy Rosary Church in 1948 and relocated to St. Patrick’s Church in 1960, retained its original “factory” cabinet, while an identical organ in King Hill Christian Church, has been incorporated into the chancel, above the baptistry. David Cool of Temple Organs incorporated the detached console into the case for its installation in the chapel of the Living Community of St. Joseph. Besides First Presbyterian and Ashland United Methodist churches, two local Lutheran churches moved their pipe organs to new buildings. 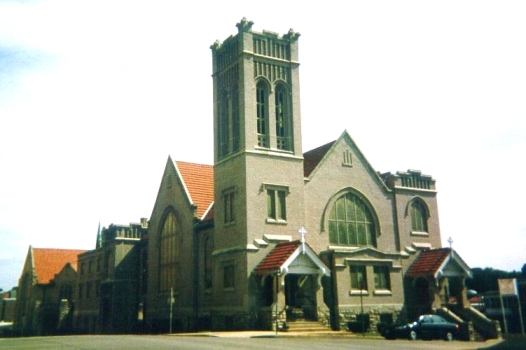 In 1962, St. Peter Lutheran Church, which had worshipped at 4th & Dolman since its founding in 1891, built a new building at 3714 St. Joseph Avenue, and relocated the pipe organ. The original organ installation was delayed for four years on account of World War II. 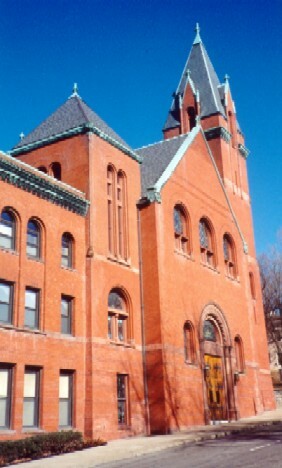 In 1968, St. Paul Lutheran Church relocated from its second building, erected in 1902 at 14th & Lafayette, to 4715 Frederick Boulevard. Retired economist and historian, Robert Coleberd, has noted that during the early twentieth century, funerals moved from the home and church to the mortuary. 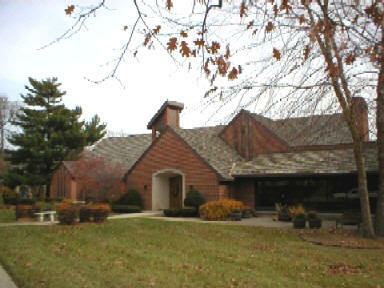 The mortuary became a “funeral home”, perhaps because in smaller communities, it often occupied a large dwelling, which was converted for this use. In an effort to create a more “churchly” setting, some of the more prosperous funeral directors purchased small pipe organs for their chapels. A well-appointed funeral home considered a pipe organ to be a competitive necessity. At one time, at least three St. Joseph mortuaries had pipe organs, including the former H. O. Sidenfaden Funeral Home, which in 1924 built a spacious new building at 1802 Union. The building also features a two story enclosed atrium into which the state rooms and chapel opened through French doors. A new two manual, four rank unit organ with chimes was purchased from the George Kilgen & Son Co. of St. Louis (Opus 3307) and held a prominent place in the chapel. While exposed pipework fell out of favor over grillwork or heavily-draped tonal openings during the twenties and thirties, this instrument featured an attractive case with pipework surrounding the built-in console. Funeral Director, Herman Sidenfaden used the organ to promote his business by featuring his staff organist and two vocalists in a weekly music program, which he personally emceed, for an early radio broadcast over KFEQ from the "H. O. Sidenfaden Chapel Studio". When the funeral home closed in the late 1960's, the organ was donated to a local institution of higher learning. The only remaining funeral home pipe organ is located in the Clark-Sampson Funeral Home at 120 Illinois Ave.
Before the phonograph, motion pictures and radio, player pianos were a popular way to bring a variety of musical entertainment into the average household, however, among America’s “nouveau riche”, the residential pipe organ became not only a means of entertainment, but a status symbol, as well. Roll-playing mechanisms reproduced orchestral transcriptions and popular music of the day, in addition to controlling registration changes and dynamic levels. Some families even had a “staff organist” on call to provide music at certain hours of the day. James L. Ellingwood, who installed two pipe organs for his home in the 1890’s for his children to play, was certainly ahead of this trend, which took hold after World War I and lasted up to the Great Depression. While many of residential instruments were custom-built to meet architectural design or space requirements of the residence, often under a stairwell or on a landing, the smaller cabinet organs were also popular. The Skinner Organ Company’s Boston factory studio was designed to look like an upscale residential organ installation. The traditional church-style drawknob console features the addition of a roll-player above the keydesk, allowing someone with no musical background to engage the instrument, much like a player piano. Skinner roll-players were designed to play multiple independent musical parts, which enhanced the performance of orchestral transcriptions. The L. M. Pinkston residence in the 3000 block of Ashland Avenue had a Kilgen “Petite Ensemble” (Opus 5496, 1935), installed in the late 1930’s, and removed more than 50 years ago. More recently, local banker and church organist, David Lewis has assembled a pipe organ in his basement, which “speaks” through the stairwell into a small pipe facade into the family room. As evidenced by the popularity of the Akron Plan, with its emphasis on the “stage” or pulpit as opposed to a high altar, and through the use of semi-circular seating fanning from a large dais, non-liturgical churches in America began looking more like theaters during the first three decades of the twentieth century. Music tastes were changing, as well. By the late nineteenth century, organbuilders began to embrace more Romantic tonal ideals. Among American organbuilders, Ernest M. Skinner (see First Christian Church) was the most prominent proponent of this movement, which had at its core the “orchestral organ” concept, wherein organ tone became more imitative of orchestral colors and overall tonal design was geared toward the performance of orchestral transcriptions, as opposed to strictly classic organ literature. The application of electricity to pipe organ mechanics greatly hastened these changes by allowing increased possibilities for physical size, layout and tonal design. Higher wind pressures allowed the creation of new sounds and the unification of ranks created many stops out of one rank of pipes. The ability of the organ to perform popular music created new markets for the pipe organ: concert halls and movie theaters. Large concert hall organs were designed to bring popular music and orchestral transcriptions to many metropolitan areas that lacked a professional orchestra. Some cities even employed a “civic organist”. Theater organs displaced pianos in smaller theaters and pit orchestras in larger theaters for providing accompaniment of silent movies, literally a “one man band”. Organists didn’t have to take breaks and could “improvise” music or sounds, such as bells and train whistles for a particular scene, while an orchestra had to rely on a printed score. While theatre organs built before World War I were often self-contained or chambered behind a pipe fence, like their church counterparts, theatre organs built after World War I were generally divided into two or more “expression chambers” flanking or surrounding the proscenium arch. Pipe fences gave way to elaborate and often heavily draped grillwork. Grillwork also replaced the pipe fence for many “chambered” church organs built between the two World Wars. 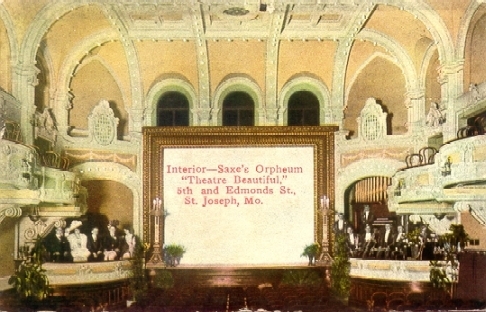 The Bennett Organ Co.'s self-contained 1915 installation in the Orpheum Theatre, formerly at 5th & Edmond, features a built-in console and pipe fence, similar to church installations of that period, while the 1927 Wurlitzer (Model 235) in the Missouri Theatre was placed behind elaborate grillwork in chambers on each side of the stage. The Great division, which traditionally had been unenclosed, was frequently placed under “expression” in a box in order to allow control of its volume, which was important in the performance of Romantic works. Tonal designs for church pipe organs became more “orchestral”, as well. 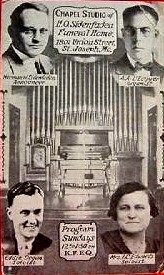 The original 1926 organ installation in Zion United Church of Christ was marketed as a “symphonic organ”. The relatively large 24 rank/26 stop specification across three manuals had no “unification” or “duplexing” of stops, except in the Pedal division. Some smaller pipe organs from this period derived an equal number of stops from far fewer ranks as a result of extensive “unification”. 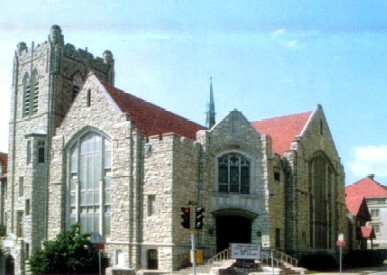 Two local examples are the pipe organs in Marvin McMurray United Methodist Church and Westminster Presbyterian Church, installed by George Kilgen & Son in 1926 and 1933, respectively. The former organ has four ranks of pipes which have been unified to create 29 stops across two manuals and pedal, noted by the “(ext)” or “extended rank”, after certain stops, meaning they share pipes with another stop. Although the Westminster organ has been rebuilt, the stoplist still reflects the extensive unification, as well as a third Choir manual, the stops of which are “borrowed” or “duplexed” from the Great division, a common practice of the Kilgen in its small to mid-size instruments. Theatre organ tastes also filtered into church console designs. While the stopkeys on church organ consoles are generally ivory-color with black engraving, with matching or either reverse couplers (black with white engraving), the stopkeys on theatre organ consoles are often in multiple colors to differentiate tonal families. The “stop rail” on church organ consoles is generally straight, while the theatre organ consoles often feature an elliptical stop rail, called a “horseshoe console”. The tilting tablet console of the 1933 Kilgen pipe organ in Westminster Presbyterian Church features black coupler tabs and white stop tabs, except for the "reed" stops, which are red, and the percussion stop (chimes), which is denoted by a marbelized chartreuse-colored tab. Another distinguishing theatre organ influence on church organs from this period is a preponderance of stops at unison pitch (designated by 8’), which were unified to also play at higher pitches, instead of using independent ranks. Higher pitched stops (above 4’) including Mixtures, almost disappeared entirely unless they were derived from a lower pitched rank (see Savannah United Methodist Church). As a result of being placed behind grillwork or draped openings, often on a sidewall instead of “front and center”, or behind a chancel arch, the tone of pipe organs from this period became somewhat muffled. As these two instruments were being built, a move was afoot to restore “classic” tonal design to American church organs and bring them out of deep chambers. Under Arthur Hudson Marks guidance, the Skinner Organ Company hired G. Donald Harrison from the venerable British firm of Henry Willis & Sons to restore the European classic ensemble to his company’s instruments. 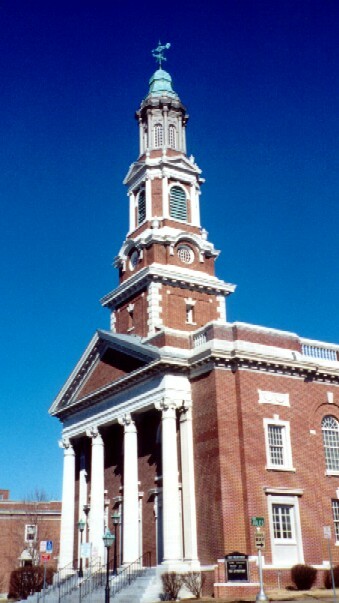 Together with Walter Holtkamp, who revived free-standing organ design (see Wyatt Park Christian Church), Harrison would help refine the “American Classic” organ tonal design, which embraced several European “schools” of organ design, becoming the prevailing standard after World War II. As the tonal pendulum swung back toward “classic” organ design, American organbuilders during the 1960—80’s took a renewed interest in the European Baroque style by copying historic designs from that period, which generally feature lower wind pressure, smaller pipe scales, articulate voicing and bright “upperwork”, including Mixtures and mutations, plus replication of historic designs for reed stops. There was also renewed interest in mechanical (tracker) action, although many of the major builders continued to use electro-pneumatic action, while adopting “new” pipe designs. Two local examples are First Presbyterian Church’s Visser Rowland pipe organ, which draws on the North German “school”, and the M. P. Moller installation in Huffman Memorial United Methodist Church. Almost one-half of the Presbyterian pipe organ’s ranks are above 4’ pitch, contributing to its bright sound, and several reed stops follow early examples, such as the Schalmey, Krummhorn and Fagott. The Methodist installation features a “Trichter Regal” stop in its specification. According to the Encyclopedia of Organ Stops, the “Regal” or “royal stop” is one of the earliest reed stops in the organ. It was named for an ancient keyboard reed instrument dating from the 14th or 15th century, and was possibly imitative or suggestive of that instrument. “Trichter”, or funnel in German, refers to the funnel-shaped resonators. The Antiphonal division of the First Christian Church’s organ, installed by Midwest Organ Service in 1960, features another example of the Regal stop, called the “Kopf (or ‘head’ in German) Regale”, because the resonator consists of a narrow pipe-like body, topped by a relatively large cylinder resonator with a conical-shaped cap. Updated February 18, 2010 . 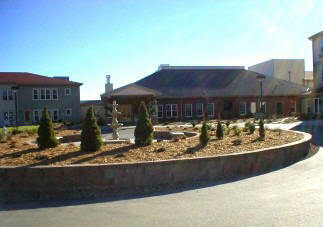 © 2000 Allied Arts Council of St. Joseph, Inc. Funding for this site has been provided by the Missouri Arts Council.